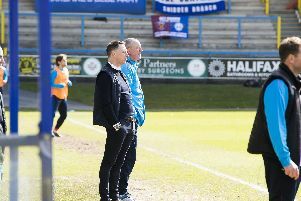 Darren Kelly warned there will be no quick fix after FC Halifax Town conceded seven goals for the second time this month. Town remain firmly rooted in the bottom four after they were hammered 7-0 by a rampant Grimsby, who were 4-0 up by half-time. Kelly admits there is a lot of work ahead to change Halifax’s fortunes, but is still convinced they can climb the table. “It’s a long process,” he said. “I’ve only been in the job a week-and-a-half. We’re under no illusions. It’s not a quick fix. “We want to try and turn it round as quickly as we can. We know there’s a lot of work to do and we’ll work hard to do that. “The games are coming thick and fast, which is good when you have a result like tonight, you have Saturday to turn it round. “But you want clear weeks so you can work on the players properly. “We’ve been having a game Saturday, a bit of recovery on a Monday then into the game on the Tuesday, then more recovery work on Thursday and a game on Saturday. “It’ll be good when these games die down a bit so we can work with the players properly. Kelly was happy with the work-rate from his players at Bludell Park, but admitted Grimsby were far too good on the night. “I can’t fault the players for effort,” he said. “They’ve come up against a very good, well-organised Grimsby side who I thought were excellent. “I think at times you have to hold up your hands up and say we weren’t good enough. “But the players put the effort in. Kelly admits Town are still short of personnel, but was pleased with debutant Nicky Wroe’s impact. “He did well,” Kelly said. “It’s difficult to come in in these circumstances but he’s got the experience of this type of environment and great experience in the game so he’ll only add value to the team. “I thought Kieran Sadlier showed lots of energy as well, but it’s a matter of dotting all the knots together, which we will do. Kelly is now calling for a response at Chester on Saturday, but admits confidence in the squad is low. He added: “You can’t sit down and sulk about it, you’ve got to respond. “Confidence could be why your mind and your feet don’t connect and you don’t feel comfortable doing things. “When you’re comfortable and you’re confident, your mind and your feet connect because they believe in what they’re going to do. “Before we came in the confidence was low but there’s a process to try and build that.